According to AAA, road debris caused more than 200,000 crashes between 2011 and 2014, killing 500 people nationwide. Road debris crashed through a vehicle's windshield, killing its elderly driver on northbound Highway 101 in Palo Alto, the California Highway Patrol said on Friday. CHP officers said on Twitter that they believe a brass bolt kicked up by passing traffic struck the 82-year-old Mountain View man on the left side of his neck. The impact prompted him to swerve and collide with the center median, before eventually coming to a stop, according to the CHP's Redwood City Division. CHP Officer Art Montiel said the projectile was about 2 to 3 inches in diameter — similar to a baseball — but weighed between 2 and 3 pounds because it was made of brass. 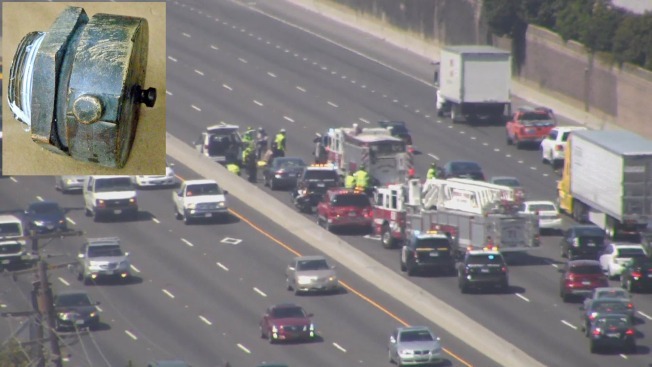 The victim was pronounced dead at the scene, which was located near the University Avenue exit, the CHP said. Two left lanes were shut down around 2:30 p.m., but reopened by 3 p.m.
Police advised drivers to take alternate routes as both north and southbound traffic were backed up on Highway 101 during the already busy commute hours. According to AAA, road debris caused more than 200,000 crashes between 2011 and 2014, killing 500 people nationwide. This year, Caltrans has picked up more than 4,000 cubic yards of debris, ranging from litter to pieces of construction equipment, from San Mateo County roads.